The Museo ng Sapatos (Shoe Museum) in Marikina just celebrated its 18th anniversary last February 16, 2019. A series of programs and activities such as live shoemaking exhibitions by Zapateria, a history of the museum and performances by the Marikina Dance Guild and Marikina Rondalla Band were lined up in celebration of this landmark. 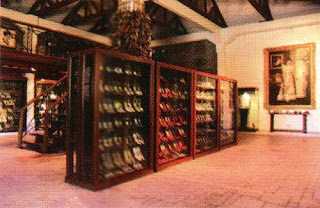 Representative of the 1st district of Marikina City Bayani Fernando established the Shoe Museum on February 16, 2001 during his tenure as the Marikina City mayor to highlight Marikina's shoe industry including the shoemakers, workers, artisans and manufacturers that contribute to the city's title being the Shoe Capital of the Philippines. Hon. Fernando attended the Shoe Museum's anniversary and announced plans to file a bill in Congress that would require the national government, government agencies and other government units to buy shoes from the Philippines only, when using government funds. To date, the Shoe Museum houses more than a thousand pairs of shoes from the country’s famous personalities, dignitaries, celebrities and former officials including presidents, senators, cabinet secretaries, diplomats and Marikina mayors. A section of the museum also houses 800 pairs of shoes from former First Lady Imelda Marcos. The Shoe Museum is also located along J.P. Rizal St. in Brgy. Sta. Elena, a few steps away from the historic Kapitay Moy building, where the first pair of shoes in Marikina were created 1887 through the initiative of Don Laureano "Kapitan Moy" Guevara. 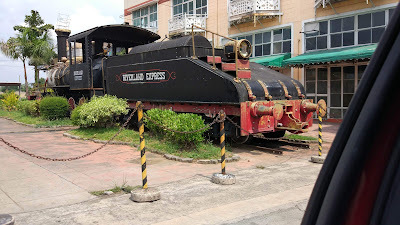 If you enter Marikina City from Quezon City via C5, you'll be passing through Marikina Riverbanks Center and one of the prominent structures you'll notice is the Riverland Express Train. The train is located beside a studio-warehouse opposite Riverbanks Mall facing the side of Marikina River. From 1906 to 1936, the "Marikina Line" was one of three lines of the Manila Railroad Company (Cavite, Marikina and Antipolo Lines) which started from Rosario, Pasig (Tramo) and continued all the way to the towns of Marikina (Daang Bakal), San Mateo and Montalban totalling 24.27 kilometers. 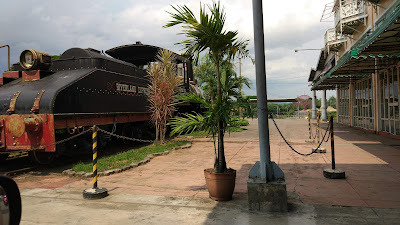 This locomotive, owned and donated by the now defunct Pampanga Sugar Development Corporation, was an actual vintage steam train used in Pampanga and Tarlac in early 20th century. Today, the Riverland Express Train is a landmark signifying the historical significance of Marikina being a part of early 20th century locomotive transportation. In search for free psychiatric consultation? Amang Rodriguez Memorial Medical Center, located at Sumulong Highway, Sto. Niño, Marikina City, provides basic consulting and brief psychotherapeutic techniques. Consulting hours are from 8:00am to 5:00pm, Monday to Fridays (excluding nonworking holidays).